V Findlay Wolfe BLOG: HEXIE LOVE!! hexagon technique, including English Paper Piecing. 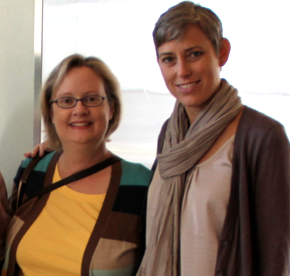 Julia and I met through our blogs way back when, then met face to face, one year at the Houston Quilt Festival! She has been very busy gal! production process – I’m the editor, manager, etc. At this point it is only digital. priced at $5.99 each. A year’s subscripton if $26.99"
Center medallion of the progressive quilt, ODYSSEY, which is patterned in each issue of this year’s Hexie Love – By the end of the year, a subscriber will have all the step in the pattern. Would you like to WIN a copy of an issue? Leave me copy telling me if you've made a Hexie quilt before? Was it Paper pieced? machine pieced? EEP? Are you new to Hexie's?? I'll draw a winner April 15th, 9am. be sure I have an email to reach you. This is one of my HEXIE quilts... "Something Old, Something NEW"
I used my Giant Hex Templates for this, which will be in my webshop shortly! My only hexie project is a table runner I have started, doing EPP. Who knows when it will be finished... I admire all the beautiful hexie projects out there, and new, faster methods are highly appreciated. Thanks for the giveaway! Happily stitching away at my 4th hexie project quilts and table-topper)! Love your giant Hex quilt! I am fairly new to hexies and so far have only used them as embellishment on other things. I really started EPP about a year ago and am making 6-pointed stars which will have hexies in-between and eventually make up into a quilt. This hop is the first I've heard about a circle technique. I have re-discovered my love of hand sewing and wold love to have a copy of the magazine. I am currently EPP-ing a scrappy 1" hexagon quilt. After 4 months it is about 34x38" big, growing steadily. Its my first hexagon OR EPP project, and I am hooked. Love how simple and portable it is! I'm working on my first hexie quilt now as my in between, carry along project. It's 2 inch hexes english paper pieced. I really like the way it's looking. Thank you for the chance to try out a new digital magazine. My first Hexie project was when I saw a beaded butterfly and decided the bead pattern would work fir a hexie pattern...(it did). Then I saw the hexie landscape in one of her books and did that with the circle to hexi. Now I have a 50 inch dragon going that I drafted myself all in shades gold. the hexies are made from a 2 inch circle so the hexie come in at 1/2 inch. I have her new book on my wish list to see what other type of trouble I can get into. I have a pile of hand dyed silk hexies that I've never put together! Maybe this magazine would inspire me to do so. I'm new to hexies but have caught the bug!! I have done nothing but make hexies the past 2 weeks (paper templates), and today I am making a 'made fabric' roll-up ditty bag so I can take my hexies and supplies with me while on the go!! I have so many ideas spinning around in my head for what to do with them!! Yes, I just finished my first hexie quilt. It took me 18 months but I love the results! It was handpieced using the traditional method of stitching them together. I've been working my way up to hexies! I have a growing attack of them. So fate, I've only sewn them into rows to adorn tea towels. Oh, and I've made several hexsgon caddy pincushions. I'm on the lookout for more projects! 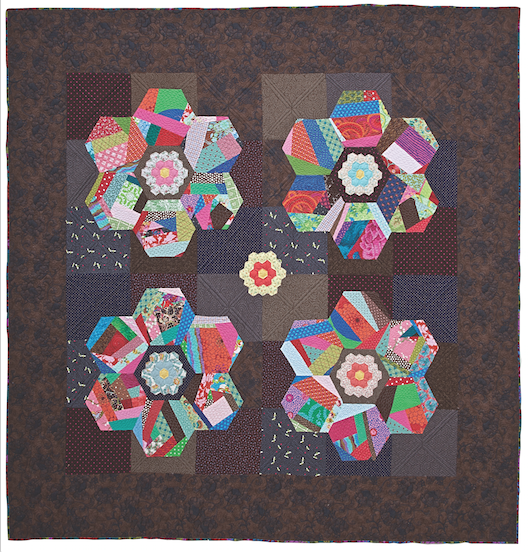 I have grand plans for my first hexie quilt but it will combine both hexes and pentagons. I'm planning to EPP those together, then applique them to large hexes, then machine stitch those together. We'll see how far I get! I'm still working on mine. It's an EPP, slow-going, but that's okay, that's kind of the point. love doing hexies. i do EPP, which i love to make and just keep adding to them. one of these days i will join them into something. When you say made, does that mean finished?? My Grandmother's Flower Garden (EPP) is not done but I have made three variations and finished them! 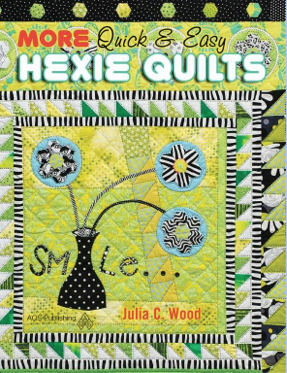 New to hexie quilting. I've only done a flower, and can't seem to find the time to do more! I am new to hexies, but love how they look. Thanks for the chance to win. Love your work! Keep it up! fun-i luv your hexie quilt! I completed a quilt with over 4,00 hand pieced 1" hexies earlier this year. It is all scrappy, and I haven't machine quilted it yet. I am nearing the end of piecing my second 4,000 piece 1" sided hexie quilt. This one is also all scrappy and will be for my teenaged son when he graduated from high school in about a year's time. I have never made a hexi quilt. However, when I had my knee replacement last summer, one of the ladies at my guild brought me some squares and a group of hexie papers. She even brought me thread and a needle! during my recuperation, I picked it up, made two and proceeded to sew them together. that is where they have stayed! LOL. Maybe a book would really help me pull it all together and love hexies! Working on an hexie quilt right now. It is my traveling companion when riding in the car. Love the looks of the book. I am sure it could teach me something fun and quilty. I have not made a hexie quilt as of yet but I think that the fence is getting wobbly and I am beginning to lose my balance and land on the side of hexie's. I LOVE your 15 min of fabric hexie's and think those might be jut the thing. I already have a large template so am ready to go. Would love to win the book for inspiration. right now have an amish style hexie in progress....all solids, done EPP.....they call it honeycomb as the hexies are pretty large meaning about 4" across at widest point....would love to win this! I'm new To hexies. I've done some freeform EPP, but haven't done anything with them. Plus I think I need to learn with using actual paper since mine aren't exactly the same. I plan on using these like appliqué if I ever get around to making enough. I have made a Hexie table runner - EPP, and am now working on a larger project. Love working with hexies. I have completed three cushion & tablemat sized hexie projects, and I'm now onto my first quilt size hexie piece. Most enjoyable. Love your giant crazy hexie quilt "Something Old, Something NEW". It's joyously inspirational. Love your hexie quilt! Sometimes bigger is better, especially if you can use up scraps! I did a EPP several years ago and just haven't gotten back to it as other projects are in the way! I've made different types of hexagon quilts. Right now I'm in the Hexagon Flower Swap, made by EPP. Thanks for joining the hop, Victoria! I made a hexie tablerunner, English paper pieced by hand, and hand quilted. I have another ready to hand quilt. I've got an EEP hexie quilt waiting to be quilted. I made it some time ago ~ maybe 3 or 4 years ago and just love it. It's the only kind I've done ~ I'd love to try one on the machine. 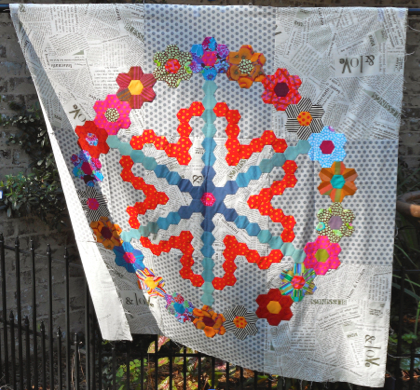 Oh, and I love your Something Old, Something New hexie quilt! It's beautiful! I currently have a queen sized diamond hexie quilt ready for binding, and Grandmother's Flower Garden almost at that point. 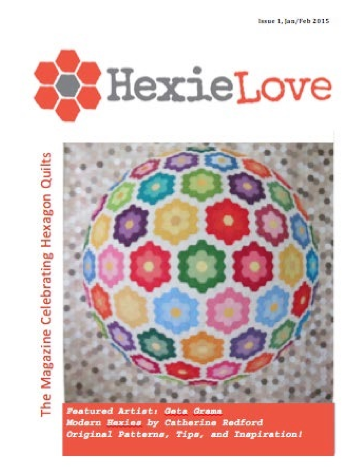 I'm a fan of Hexie Love, having purchased the first two issues. Thanks for the opportunity to possibly win the third issue with your giveaway. Looks like a fun and inspirational magazine--thanks for the chance to win! I certainly do love hexies. I have made a scrappy hexie flower quilt with large two inch hexies I paper pieced using flannel fabric then I jpgand quilted it. The other unfinished project is a reproduction quilt hand pieced with over 100 hexie flowers appliqued. I am up to sewing the final border on this and all the flowers are attached to this. Thanks for being in Julia's Blog Hop. I am glad to meet new bloggers and get new and inpirational ideas! I have hexied for quite a few years - mostly GFG and now I'm finishing one for my only Granddaughter who graduates from high school next year. I am quite proud of it - it is in 1" hexies single round flowers and using batiks and Michael Miller Fairy Frosts. I have just started a 3" hexie Millefiori quilt along online that I am loving but it is such an addictive process plus I love the EPP! Thanks again! Also available at usbrays04@aol.com as well as google. I'm (slowly) working on EPP hexies for a wall quilt I'm designing in my head (using zippers as the stems on the flowers). I'd never made hexies until about 2 years ago. Nice to do, while watching TV with the family. I started an EPP hexie quilt but gave it away before I finished it. It was started many years ago and I was using the same fabric. Thanks for a chance to win. I'm new to quilting but one of the things on my long list of 'want to do's is a hexie quilt so this magazine would be a great help, thanks! I have a couple of small Hexie projects in the works, but would love to tackle something bigger.